In the May/June issue of La Cucina Italiana, www.lacucinaitalianamag.com, there is an interesting article on the last page entitled what a fiasco. The fiasco the article refers to is not a disaster or a problem. Instead, it tells the history of the straw clad Chianti basket, the fiasco. Of course, we all remember the bottle…a not too long neck that flowed into a rounded bottle nestled in a straw basket. When empty, the bottle served as a wonderful candleholder. Back in the day, I would vary the candle color to add a rainbow effect to the mountain of drippings that hugged the bottle’s curves. While I have none left, I did find this on a site called The Cottage and it looks just like mine did after burning a few candles. But back to the history…Long before commercial trucking was available, bottles of wine were carried on horse drawn carts, up and down hills and through winding roads. Not surprisingly, the bottles could rub against each other and break, especially when a single cart could carry more than 3000 kilos of wine. 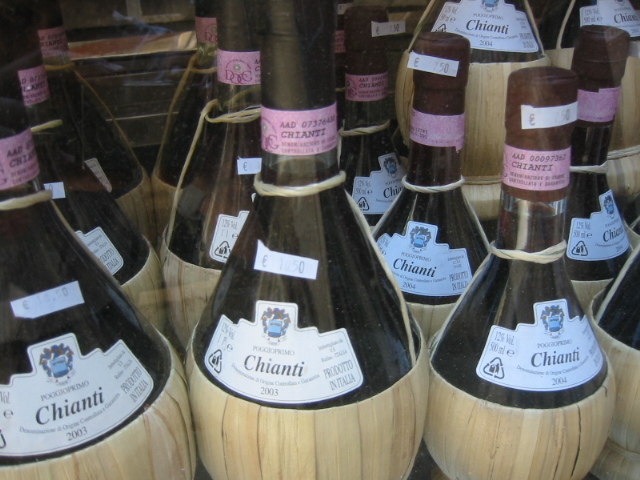 In order to protect them, the Chianti bottles were wrapped in straw. This great photo shows Chianti fiaschi arriving in Florence via horse drawn carriage, a few workers, and no broken bottles. So next time you pour Chianti from regular wine bottles, and some very good ones at that, raise a glass to the simple ingenuity of times gone by, and remember, a fiasco can be a good thing! And to you as well! Salute! Thank you for sharing this delightful tidbit. Your interesting posts are adding to our longing and excitement for our September stay in Corona. Too bad we will not be there in September to meet you, but happy for you. Judy … thanks for the wonderful history lesson on the Chianti bottle and for stopping by and commenting on my blog. Italy sounds wonderful. Maybe some day I’ll get to visit! Where could I get a copy of the picture of the 3000 kilos of chainti, What a great picture. The picture is on the last page of the current issue of La Cucina Italiana magazine. Not sure where you might get a copy as it wasn’t referenced in the issue, so I gave the magazine the credit. I agree…it is a great picture! Thank you I have been searching for it with no luck if I come up with anything I will post. Imight contact magazine. This summer I am going to pick through stacks of old b/w photos at the markets…there must be some very interesting ones!